There are a ton of things I miss about my birth country, but the food and the Pacific Ocean are probably the two I miss the most. The only way for me to solve this is to travel back home, but since it’s been almost two years since our last trip there, I have to settle for the “encargos” my mom brings with her to Denver every time she goes back to Peru. Through the years, the list hasn’t really changed much: alfajores, ají amarillo and Pisco. 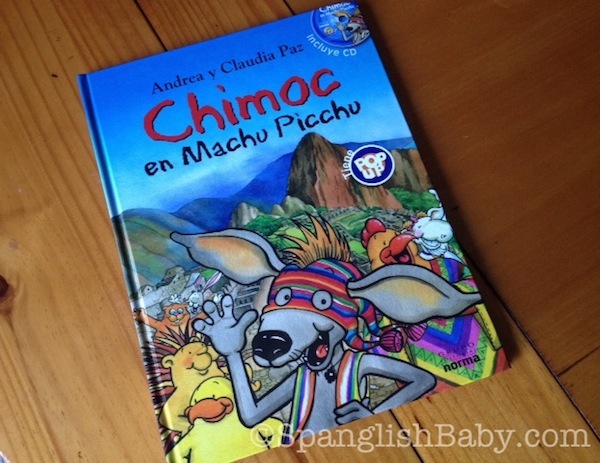 But ever since I became a mom, my list also includes children’s books in Spanish, chompas de alpaca (alpaca sweaters) and polos de algodón peruano (T-shirts made with Peruvian cotton), and most definitely the kind of Peruvian candy that reminds me of my childhood and that my kids have somehow learned to love too. 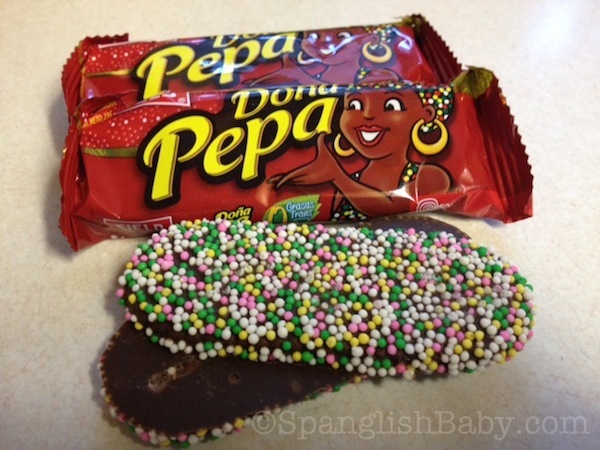 Vanessa’s favorite is Doña Pepa. 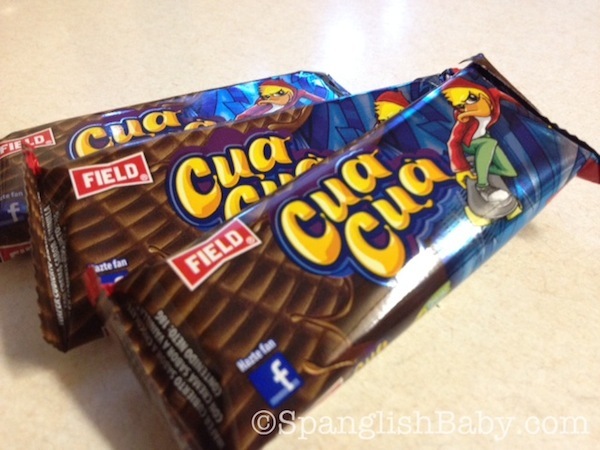 Santiago’s favorite is Cua Cua. I love seeing them enjoying these candies of my childhood because it makes me feel closer to my beloved Peru. Same thing happens when I see them enjoy un buen plato de arroz con pollo or devour a triple — a Peruvian sandwich made with avocado, hard boiled eggs and tomatoes and one of Vanessa’s favorite dishes. 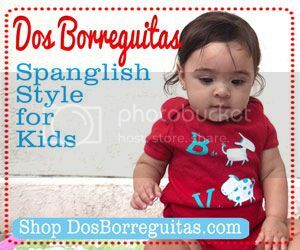 But I also feel like many of these “encargos” show my kids how important it is for me to continue to stay connected to my Peruvian heritage. I tell them how they won’t believe how warm their Alpaca sweaters will keep them (and after wearing hers during the bitter cold we experienced in Denver this weekend, Vanessa agrees); I tell them how Peruvian cotton is some of the softest in the world, which is one of the reasons why many clothing stores worldwide get their T-shirts done there; and thanks to some of the books my mom has brought back, I can teach them more about Peru’s traditions, culture and customs. What kind of things do you ask for from your home country? I’m Latina, not by birth, but by spirit and heart. Spanish was one of my majors in college, because I fell in love with the language and the culture in high school. After studying abroad for 6 months, all things Argentine make my heart happy. I’m a quarter Italian and my grandfather never learned Italian because that wasn’t what “being an American” meant when he was growing up. It makes me so sad to have lost that part of my heritage and I want to instill part of my “Latin” roots in my kids. Estoy totalmente de acuerdo. Yo también intento que mi hija conozca todo lo que fue importante para mí cuando era niña: los libros, la comida, las series de televisión, las canciones…Soy cubana y vivo hace muchos años en Moscú. Dada la distancia, recibimos más encargos de España que de Cuba, entre ellos discos de música cubana con canciones infantiles, libros de poesía cubana, algunos bolsitos artesanales (de cuero, algodón). De comida dulce de guayaba, chorizo/jamón/fuet, turrones… Algunas de esas comidas se pueden encontrar aquí, pero hay poca variedad y los precios son muy altos. haha i LOVE your post! I grew up getting “encargos” from Ecuador! 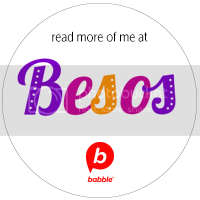 Now it is easier, because we can find alot of things at our local supermarket, BUT now that i am a mom, i still ask friends to bring Galletas Amor, (wafer cookies) and books or toys in Spanish and Enzo loves galletas de coco and rosquitas! Sometimes they also send me clothes, made from Ecuadorian cotton, just like yours made from Peruvian cotton! I also grew up only eating Ecuadorian tuna which is MUCH better than bumble bee, but they sell that here now! We have some Ecuadorian cheese (it’s so good) and eggnog type drink for Xmas. I know i am forgetting alot of things! me encantan los encarguitos! Cua-Cua! OMG my heart aches just thinking about my childhood, sharing those candy bars with my friends. Today is the anniversary of the city of Lima. And I wish I could be there. Sigh. 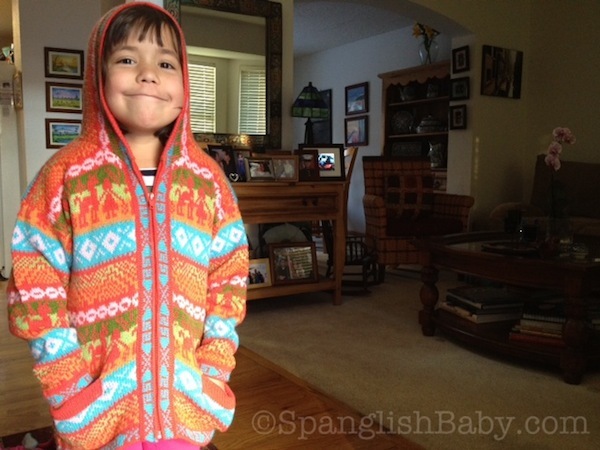 Nice blog, your kid looks adorable in his Incaica jacket. Hello — I was thrilled to find one of the books by the author you cited at my local library! I’m teaching my children about Peru. I’m developing a site site and I was thinking of modifying the template.Yours looks pretty decent! 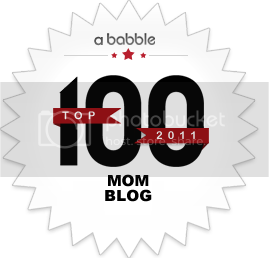 You could visit my website and tell me your viewpoint! I’m a subscriber and we liked el tren….. This is the best site for anybody who desires to find out about this topic. You notice so much its nearly onerous to argue with you (not that I truly would want…HaHa). You undoubtedly put a brand new spin on a topic thats been wrote about for ages. Nice stuff, simply nice! Hmm Well I was just searching on yahoo and just came across your website, generally I just only visit websites and retrieve my required info but this time the useful information that you posted in this post urged me to post here and appreciate your diligent work. I just bookmarked your site. Thank you again. Visita nuestro blog de consumidores, es muy interesante. Any wway I’ll be subscribing to your augment or even I fulfillment you get entry to constantly quickly. It’s the first time when i’ve seen your site. I can gather a lot of hard work has gone in to it. It’s really good. In any case I’ll be ssubscribing too your feed and I hope you write again very soon! I needed to put you this little bit of observation to thank you so much again with your exceptional basics you’ve featured here. It has been certainly remarkably generous of you to allow openly precisely what many individuals would have sold for an e-book in making some bucks for themselves, even more so considering the fact that you might have done it in the event you desired. The strategies likewise worked to be a good way to fully grasp the rest have a similar desire the same as my very own to figure out great deal more on the subject of this matter. I am sure there are thousands of more pleasant moments up front for those who view your site.